Includes 5-gallon polypropylene tank. Tank lid has 1 1/2" FNPT (38.1mm) side intake port, 1 1/2" FNPT (38.1mm) top discharge port, and 2" FNPT (51mm) top vent port. Easy-to-remove filter trap. 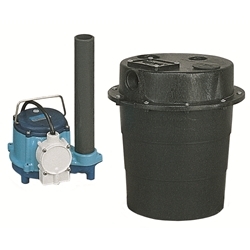 Also includes 1/3 HP automatic submersible sump pump with 8' (2.4m) power cord and 3-prong grounded plug; and 1 1/2" (38.1mm) diameter pipe from pump to lid. Basin is IAPMO approved.